"Efficacy of neratinib in hormone receptor-positive patients who initiated treatment within 1 year of completing trastuzumab-based adjuvant therapy in HER2+ early stage breast cancer: subgroup analyses from the phase III ExteNET trial"
LOS ANGELES--(BUSINESS WIRE)--Puma Biotechnology, Inc. (Nasdaq: PBYI), a biopharmaceutical company, announced that results from the subgroup of patients with hormone receptor positive (HR-positive) breast cancer from the Company’s Phase III ExteNET Trial of neratinib for early stage HER2-Amplified breast cancer are being presented at the 2018 San Antonio Breast Cancer Symposium (SABCS) that is currently taking place in San Antonio, Texas. The presentation entitled, “Efficacy of neratinib in hormone receptor-positive patients who initiated treatment within 1 year of completing trastuzumab-based adjuvant therapy in HER2+ early stage breast cancer: subgroup analyses from the phase III ExteNET trial,” is being presented at a poster session by Dr. Frankie Ann Holmes, Texas Oncology/US Oncology Research, Houston Texas on Thursday, December 6 from 7:00 - 9:00 a.m. CST. A copy of this poster is posted on Puma’s website at www.pumabiotechnology.com. In September 2018, the European Commission (EC) granted marketing authorisation for NERLYNX® (neratinib) for the extended adjuvant treatment of adult patients with early stage hormone receptor positive HER2-overexpressed/amplified breast cancer and who are less than one year from the completion of prior adjuvant trastuzumab based therapy. This poster presentation highlights the data that was the basis for the EC approval. 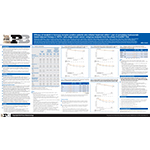 In the subgroup of 1334 patients with hormone receptor positive disease and who were less than one year from the completion of prior adjuvant trastuzumab based therapy, the data, presented in the poster, demonstrated that after two years of follow-up, invasive disease-free survival (iDFS) was 95.3% in the patients treated with neratinib compared with 90.8% in those receiving placebo (hazard ratio = 0.49; 95% CI: (0.30, 0.78); p=0.002). The presentation also showed that after five years of follow-up, invasive disease-free survival (iDFS) was 90.8% in the patients treated with neratinib compared with 85.7% in those receiving placebo (hazard ratio = 0.58; 95% CI: (0.41, 0.82); p=0.002). The poster highlighted that in this same subgroup, distant disease-free survival (DDFS) was 96.1% in the patients treated with neratinib compared with 92.9% in those receiving placebo (hazard ratio = 0.53, 95% CI: (0.31, 0.88); p=0.015) after two years of follow-up. After five years of follow-up, distant disease-free survival (DDFS) was 92.4% in the patients treated with neratinib compared with 87.7% in those receiving placebo (hazard ratio = 0.57; 95% CI: (0.39, 0.83); p=0.003). Additionally, in this population, there were 295 patients who did not achieve a pathological complete response (pCR) after treatment with neoadjuvant therapy. This exploratory subgroup is similar to the patient population in the Phase III KATHERINE trial of Kadcyla. The data presented demonstrated that in this subgroup, after two years of follow-up, invasive disease-free survival (iDFS) was 89.9% in the patients treated with neratinib compared with 85.2% in those receiving placebo (hazard ratio = 0.64; 95% CI: (0.30, 1.29)). Longer term follow up demonstrated that at five years, invasive disease-free survival (iDFS) was 85.0% in the patients treated with neratinib compared with 77.6% in those receiving placebo (hazard ratio = 0.60; 95% CI: (0.33, 1.07)). The profile and frequency of treatment-emergent adverse events in this subgroup of patients with hormone receptor positive disease and who are less than one year from the completion of prior adjuvant trastuzumab was similar compared with the overall safety population. The most common grade 3 treatment-emergent adverse events in this subgroup were diarrhea (neratinib, 39% vs placebo, 1%), nausea (1% vs <1%), and fatigue (2% vs <1%); rates in the overall safety population were diarrhea (neratinib, 40% [included one grade 4 event] vs placebo, 2%), nausea (2% vs <1%), and fatigue (2% vs <1%). This press release contains forward-looking statements, including statements regarding the benefits of NERLYNX® and neratinib and the timing for commercial launch of NERLYNX® in Europe. All forward-looking statements involve risks and uncertainties that could cause Puma’s actual results to differ materially from the anticipated results and expectations expressed in these forward-looking statements. These statements are based on current expectations, forecasts and assumptions, and actual outcomes and results could differ materially from these statements due to a number of factors, which include, but are not limited to, the risk factors disclosed in the reports filed by Puma with the Securities and Exchange Commission from time to time, including Puma’s Annual Report on Form 10-K for the year ended December 31, 2017. Readers are cautioned not to place undue reliance on these forward-looking statements, which speak only as of the date hereof. Puma assumes no obligation to update these forward-looking statements, except as required by law.